Are you wondering if a Newfoundland Lab mix puppy is right for you? We take a look at the pros and cons of this adorable cross breed. 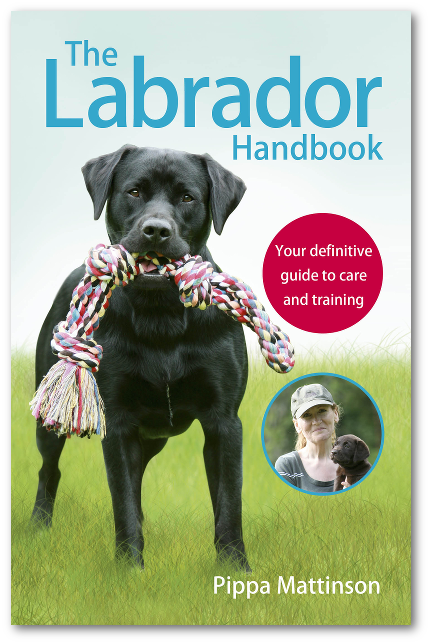 Welcome to our complete guide to the Labrador Newfoundland mix! The Newfoundland Lab mix is the result of a Newfoundland cross Labrador. Newfoundlands and Labradors have always been popular breeds as family pets, so it makes sense that their cross breed is also gaining popularity! Cross breeds can inherit the personality traits or physical characteristics of either of their parent breeds, meaning the outcome can be a little unpredictable. 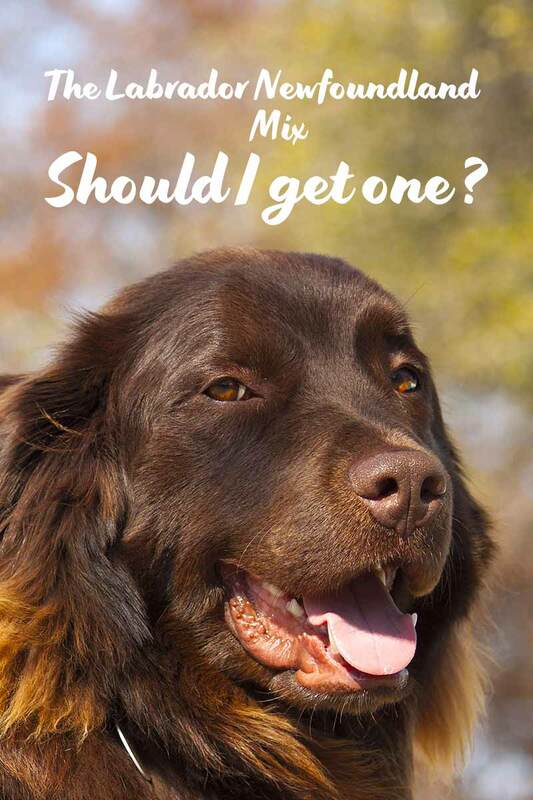 If you’re considering getting a Newfoundland Lab mix, it is important to know the potential characteristics you could be getting in your new puppy, whether they come from the Labrador or the Newfoundland dog. Additionally, mix breeds in general have received criticism about their health and cost, amongst other issues. Firstly, let’s look at this debate about mixed breeds so you’re completely clued in before making a decision about getting one! Controversy of Designer Dogs – Does it Matter? A designer dog is a cross between two purebred dogs. Designer dogs have faced some criticism in the canine-loving community, especially in comparison to purebred dogs. These criticisms aren’t all baseless, however, it doesn’t mean mix-breeds are all bad, and there are some great reasons to love mix-breed dogs. Let’s look at some of these pros and cons in a bit more detail. Many people criticize mixed breed dogs, as they believe they are less healthy than purebreds. Whilst some mixed-breed dogs are bred to have some unhealthy traits, such as pugs and french bulldogs, who are bred to have short snouts and can consequently suffer from breathing problems, other mixed breeds are just as healthy as purebred dogs. Additionally, just because a dog is purebred doesn’t mean it has a perfect bill of health. Purebreds are sometimes achieved through inbreeding. This can entail a multitude of health problems – you can read more about the science behind these genetic problems here. Some suggest that hybrid dogs are necessary to breed out the problems inbreeding and breeding for certain characteristics has created. Another issue some people have with hybrid breeds is their price tag. Designer breeds tend to come with a designer price tag, which can lead to puppies costing thousands of dollars. Unfortunately, raising a puppy is likely to be expensive no matter what, once you consider the cost of vaccinations, food, and vet bills. Prices will vary depending on the cross, and some mix-breeds are unreasonably expensive considering the health issues they come with. However, sometimes this price tag is really worth it for the dog you get. If you want to read more about the debate between purebreds and cross breeds, you can check out this article. Let’s get back to the Newfoundland Labrador mix specifically. 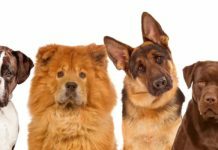 Because mixed breeds can inherit qualities from either of their parent breeds, it is important to consider the qualities and histories of both parent breeds, as well as the cross. Let’s start with Newfoundland dogs. This breed originated on the coast of Newfoundland and Labrador in Canada and got its name in 1775. While we don’t know its exact origins, people assume it has links to the Tibetan Mastiff. In Newfoundland, these dogs were used as working dogs for their strength, especially in the water, or as ship companions. Newfoundlands are strong swimmers and have even been known to save people from drowning! Labradors come from the same Canadian coastal province, Newfoundland and Labrador! These dogs were also used in the water, but as fishing, retrieving dogs rather than rescue dogs. The Labrador used to be known as the lesser Newfoundland, and was also used for its strength, despite being smaller than the Newfoundlands. These lesser Newfoundlands were taken to Britain in the 18th century and were renamed Labrador retrievers. Labradors were officially accepted by the American Kennel Club in 1917 and have been hugely popular ever since. Newfoundland and Labrador retriever mixes are relatively new, so you won’t find much about them from a basic internet search. Because they’re a mixed breed, they are also not officially recognised. But despite its ambiguous history, we can still predict the qualities of a Newfoundland Lab mix by looking at its parents. Newfoundlands are mostly known for their size – they’re huge dogs. Newfoundland females can reach up to 26 inches in height, and males can grow up to 28 inches. Their weight is just as impressive – on average males weigh between 130 – 150 pounds, while females weigh between 100 and 120 pounds. It’s easy to see why Newfoundlands were used for their strength and size as working dogs! Labrador retrievers aren’t small dogs, however, they don’t come close to the size of Newfoundlands. Male Labrador retrievers can grow to between 22 and 24 inches, whereas females tend to grow 21 to 23 inches. Males generally weigh between 65 and 80 pounds, whereas females reach 55 to 70 pounds. The size of a Newfoundland Lab cross will completely depend on the genes it inherits. It could be anywhere between the sizes above! To know what our Newfoundland Labrador will look like, we need to discuss the parent breeds, too. The Newfoundland’s size is striking, but what about its other features? These dogs are muscular with thick, medium-length coats made up of an undercoat to keep the dog warm and a water-resistant outer coat. Their fur can be wavy or straight, and feels coarse to the touch. Their coat can be brown or gray, but is most commonly black with white markings. Labradors are also muscular dogs, despite their slightly smaller stature. They also have a soft, thick undercoat and coarser, waterproof outer coat, but their fur is much shorter than the Newfoundland’s. 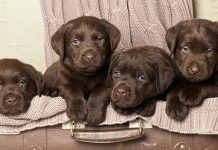 Purebred Labradors come in three main colours- chocolate, yellow, and black. Purebred Labradors and Newfoundlands look quite different, but their crossbreeds can be a mixture of any of these physical characteristics. It is important to remember this if you’re favouring some characteristics over others – you cannot guarantee you will get them in your mixed breed puppy- it’s a genetic lottery! 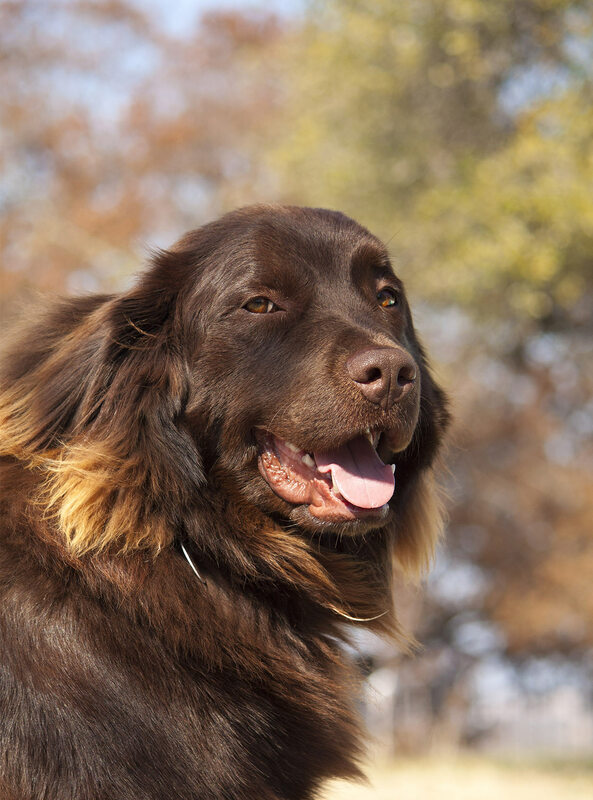 Both Newfoundlands and Labradors are known for their lovable personalities. Both are great companions for humans and love working alongside people. Newfoundlands and Labradors are both very intelligent dogs, which means they respond well to training- another reason why they make such great working dogs. Both breeds are incredibly friendly, devoted, and good with children, so they make great family pets. You should watched both breeds when with other dogs, but they are friendly as a general rule. Typically, Newfoundlands are more patient, whereas Labradors are more active and energetic. 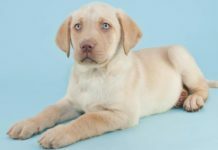 Your mix will have a combination of any of these characteristics, but because Labs and Newfoundlands do have such similar personalities, you’re almost guaranteed to get a puppy that’s friendly, intelligent, and devoted to its family. Labradors and Newfoundlands have quite similar coats, but their grooming needs do differ. To keep your Labrador’s coat at its most luxurious, you should comb it weekly, but this isn’t absolutely necessary, as its shorter length means it doesn’t get tangled as frequently. Because Newfoundlands have a heavier, longer coat than Labradors, they should be groomed much more regularly to keep their fur from knotting. You may also want to trim their coats, especially in hot weather, as their heavy coat can make them uncomfortable if they’re in hot houses or warm weather. 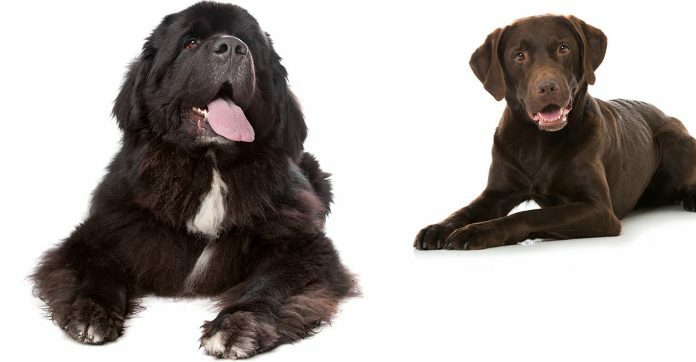 The grooming needs of a Newfoundland cross Labrador will depend on the coat it inherits- you may need to use your judgement to see how often you should groom your dog, and whether its coat needs more attention, especially in the summer months. Both Labradors and Newfoundlands require a lot of exercise. They fare best when they have access to the outdoors, as well as lots of room in their houses. They can exercise on land or in the water, as both of these dogs love swimming. A Newfoundland Lab mix will also need lots of exercise, but if you’re letting your Newfoundland Lab puppy go swimming, you will need to make sure you watch him, ensuring he has a safe way out of the water and is comfortable swimming. Both Labradors and Newfoundlands can be prone to obesity if not cared for properly. This is a trait that will likely be passed on to your Newfoundland Lab puppy. To combat this, you need to ensure you are monitoring what you feed your dog, but also give your pup lots of regular exercise. Not only will this keep your dog happy, it will also help combat any excess weight that your pup could put on. 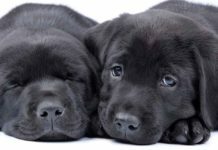 Parent breeds can pass on health issues to cross breeds, so we should look at the different problems Labradors and Newfoundlands tend to suffer from. Here are a few of the big ones: gastric torsion, Subaortic Stenosis, canine hip dysplasia, osteochondritis dissecans, epilepsy, patellar luxation, and diabetes. There are a few ways to minimise the chances of these health issues in your cross breed, but unfortunately no way to avoid them with certainty. 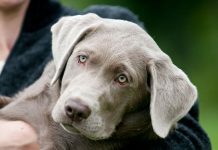 It is important to make sure you’re with a reputable breeder, and know that the health of each parent dog has been tested for issues like those listed above. 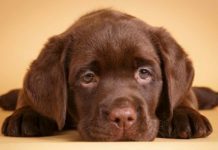 This should help minimise the chance of getting these problems, however, you will need to also take your Newfoundland Lab for regular check-ups at the vet. Your vet may focus on the eyes, heart, and joints of your cross to identify if any of these issues appear. Newfoundlands usually live between 9 and 10 years, whereas Labradors can live from 10 to 12 years. As long as you keep your cross as healthy as possible, it could live anywhere between these ages. Because both Labradors and Newfoundlands are very social, intelligent dogs, it is likely that your Newfoundland Labrador cross will inherit these traits. Intelligent dogs take well to training, but this doesn’t mean you can be lazy about it. You should train and socialise your dog with both people and other dogs from a young age. This will ensure that your cross is friendly and happy as it grows up and experiences new situations. Training your Newfoundland Labrador cross is also important because these dogs can grow to be very strong. If you haven’t trained your dog to respond to its name, to heel, and other basic commands, you may find yourself unable to control it in public, especially if it’s in a new situation that is frightening. Training your dog from a young age is a good way to keep it happy and ensure it never gets hurt, or accidentally hurts anyone else. When looking for a Newfoundland Labrador puppy, you need to find the most reputable breeder possible. Make sure to go to your breeder with a list of questions to make sure the puppies and their parents have been well looked after, and that they’re as healthy as possible. A good way to choose a breeder is to read reviews from people who have used them before. Don’t be afraid to be picky! Choosing a healthy puppy from a reputable breeder is the way to find the best cross you can. Is a Newfoundland Lab Mix Right For Me? As we’ve briefly looked at, Newfoundland Labrador crosses are going to be very active dogs. They will be best suited in homes that have a lot of space, ideally with access to the outdoors. Newfoundland Labradors do not fare well in houses where they’re cooped up, as they require lots of exercise to keep them healthy and happy. As long as they’re socialized well, they also make great family pets and get on well with children. If you’ve got the time and energy to commit to a Newfoundland Lab mix and want a loyal, loving dog, it’s the perfect breed for you!